Big crazy week this week. We’re moving out of Upper Street – our home for the past 12 years! We shut the doors on Wednesday evening and (great news) prep the space for a big warehouse sale which we’re holding for one day only – this coming Saturday. If you’re on the mailing list you’re receive an alert otherwise I will put all details here. There will be lots of products that we are not taking to the new store, plus samples, plus stuff found in the back of the warehouse, plus stuff from here, literally stacked on the floor (not beautifully styled like I normally do). Everything must go so there are great bargains to be had. We’re not putting any of it online regrettably (a little too swamped right now) and please note that we hand over the keys to the landlord literally a day after so we can’t keep stuff there or anywhere else for that matter – we’re in transit (beyond scary). Whether you have a tiny plot of land, a balcony or acres having a garden is so rewarding. I’m really loving it recently, and was lucky enough to get to go to Chelsea Flower Show last week (thank you Gem, my birthday present!). I thought I’d share a few of the tips I picked up from some of my favourite gardens at the show. Oh and I should add I am be no means a master gardener (anything but! ), everything I’ve learnt is through trial and error. Chelsea had every garden you could possibly imagine. So start with what do you want. A veggie garden, herb or flower garden? 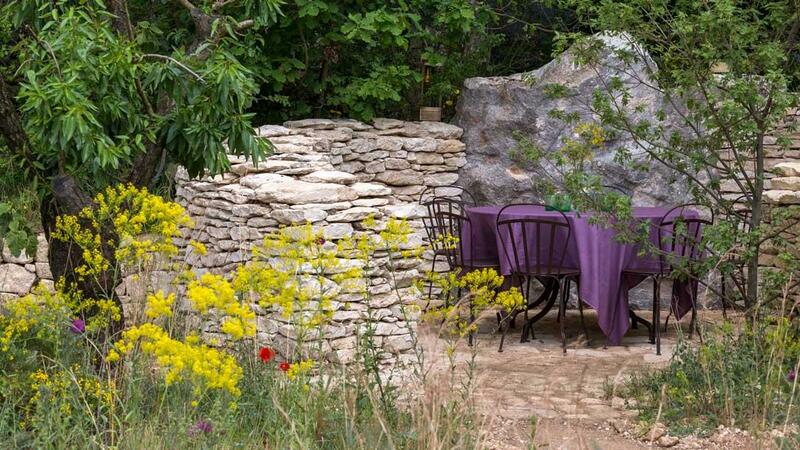 A patio to dine at, or a wild flower meadow to bask in (I know, we can all dream!)? Do you want annuals or would your prefer perennials? With this decided you can then approach it like any other design project, and gather visual inspiration – perhaps start with a moodboard. When I began I simply searched out images on Pinterest of gardens I gravitated towards, or inspiring spaces I’d visited like the high line in NYC. I pulled a bit of what I loved from each of these images and created pretty much what I have now. All vegetables and most flowers need approximately 6 hours of sun a day. However if your space is quite shady don’t despair, there are lots of plants that flourish in sunless gardens like ferns, bamboo – all sorts. As I’ve gone more and more forest-like in my garden there is more shade than ever so I’ve planted a ton of ferns and other fern loving shrubs which I adore… I basically want a gigantic jungly garden, dripping with creepers like the Beauty of Mathematics Garden. I’m obsessed with their giant succulents! Some people pore over magazines plot and plan, I simply hotfoot it to the nearest coolest garden centre and see what wows me. I’m also very impatient I’m afraid! I’m not into waiting 10 years for something to grow I want it grown, mature and huge (demanding no)? If you buy large plants you often need to pay more, or you can go for the super speedy growers like bamboo or climbing trees. For instant greenery, you can’t go wrong with some grasses or box or even a moss pooch or two! 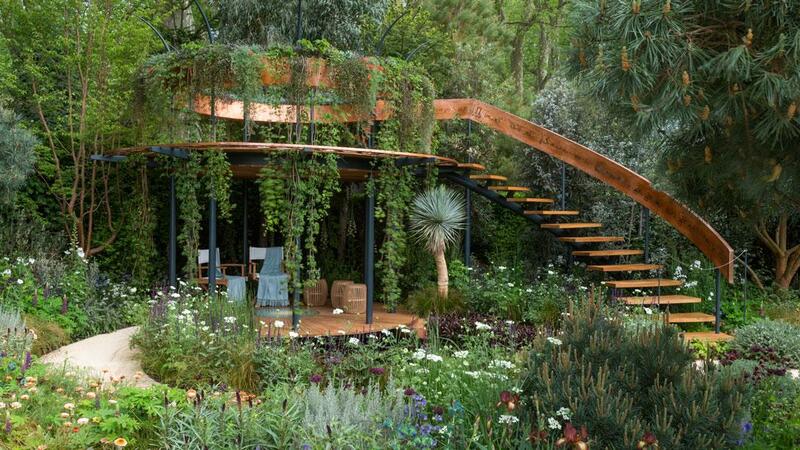 All the gardens I gravitate towards at Chelsea Flower Show were predominantly green – a smattering of other colours mixed in perhaps, but I loved the lusher and greener the better! You should settle on a colour scheme before picking your plants obviously – I’ve got a pink hydrangea in the garden and I am so not a pink fan. I think you can change the colour (by changing the pH balance apparently) but I’ve never gotten round to i. I just pick the heads off as soon as they bloom and plop them in a vase! I bought it without looking at the colour I just loved the shape – bonkers I know. Everything else is a variation of green, green, green, which gives me a sophisticated look year round. As we all know the bigger something is the grander it looks. So source out larger containers, they will look way cooler than lots of iddy-biddy ones. This is so important especially if you have a small space. I got large gold containers from Homebase which shimmer softly in the sunlight, others have come from Petersham & Clifton nurseries.